Looking for an easy way to decorate a room that doesn’t cost a lot? How about making pillows. Easy design to change out often. I love to sew. I learned a little from my mom and then learned more in Junior and Senior High School in Home Economics class. Do schools even have Home Ec anymore? I have to admit. I loved those classes. 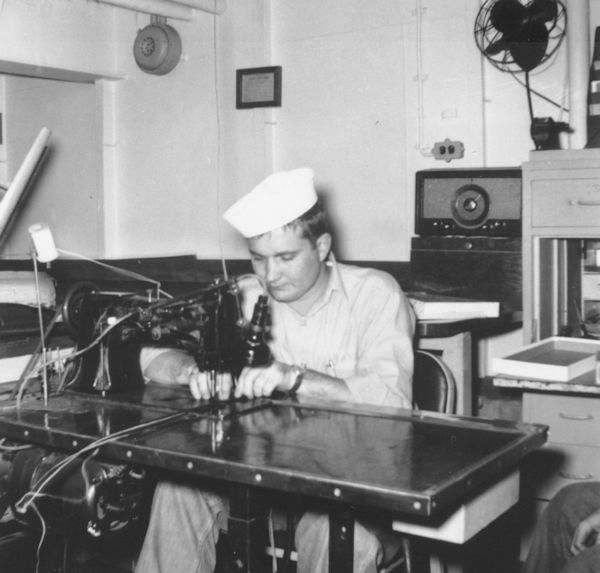 I think I also might have been inspired by my dad who did a lot of upholstering while he was in the Navy. So, a sewing machine pretty much has been around me all my life. After I married, I made so many clothes for myself and other items for the house. I could make a whole outfit for just a few dollars and use the same pattern over several times. And when my son was born, I made his little rompers while he was small and several costumes. My sewing machine sat idle in the closet for several years until recently. I would occasionally drag it out to make something quick. But for the most part, I lost interest. I recently wanted to add some color to the house but didn’t want to spend a lot, so I decided to make some pillows. The sewing bug had bitten me again. 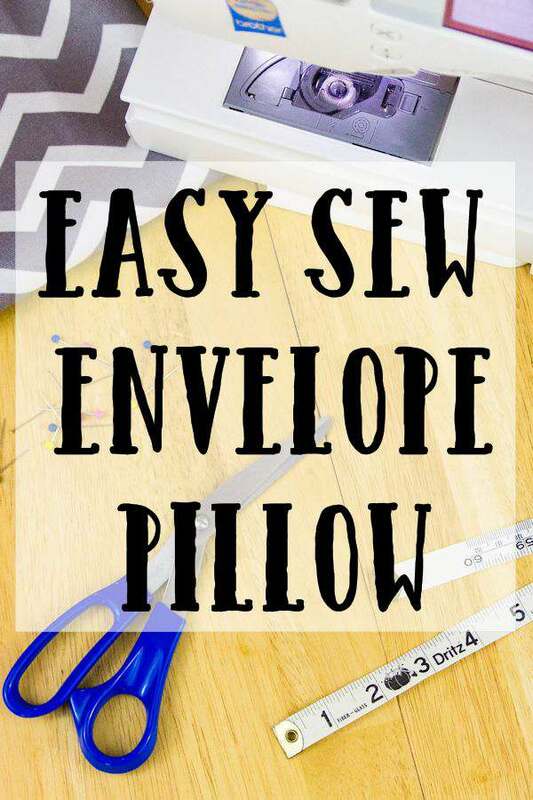 An envelope pillow is a great starter pillow to make. No zippers and all you need to do is sew a straight line. No curves or fancy stitches. The art of sewing is fun to learn but starting off with a fun and simple project won’t discourage the beginner. And there are several sewing machines out there for the beginner sewer. The hardest part for me is choosing what material and colors I want to make the pillow cover from. I usually go to JoAnn’s and check out the sale bins and end up with several pieces to make pillows from. I only need 1.5 yards to make an 18″ x 18″ pillow. 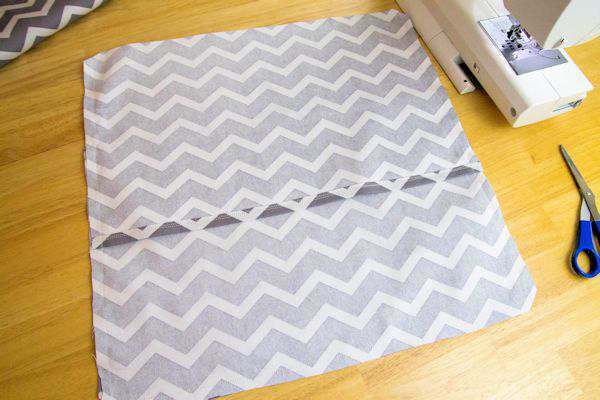 I found a really nice gray and white patterned material to make this project with. 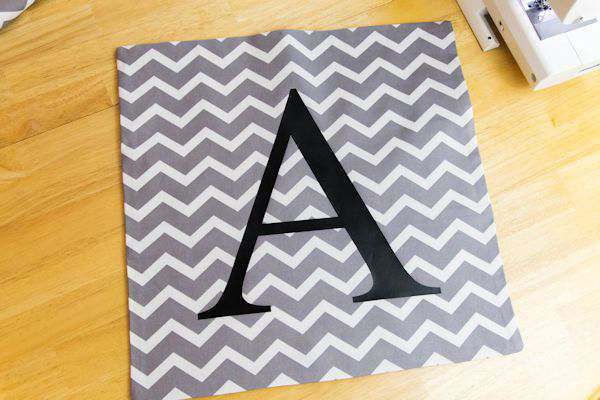 I also wanted to add the letter A to the front (the 19″ x 19″ piece) so I used my Silhouette and heat transfer vinyl to do that before I did any sewing. Make sure your iron is ready. Use the settings recommended for the material you have. 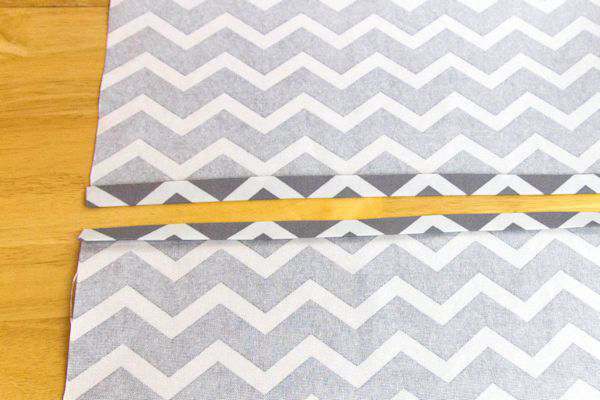 Since the material I choose had stripes it was easy to cut a straight line for each piece. 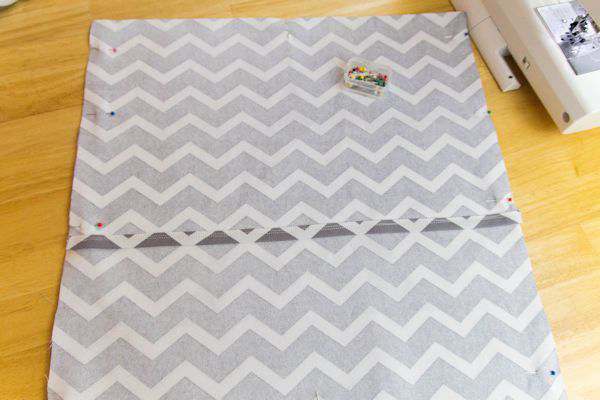 If you plan on making several pillows, you could make a template out of tissue paper or poster board. I will show you how to make a template in another post. You want to cut each piece as straight as possible. It really helps when you have straight lines when you start to assemble the pieces. First, start with the 2 short pieces. Set the 19 x 19 piece of material to the side. Iron down one side about 1/2 inch on each piece. Your iron is your best friend on this project. Turn over the 1/2 inch pressed area again so the raw edge will now be on the inside and no raw edges will show when you sew the seam. Iron each seam again to make sure they are nice and flat. 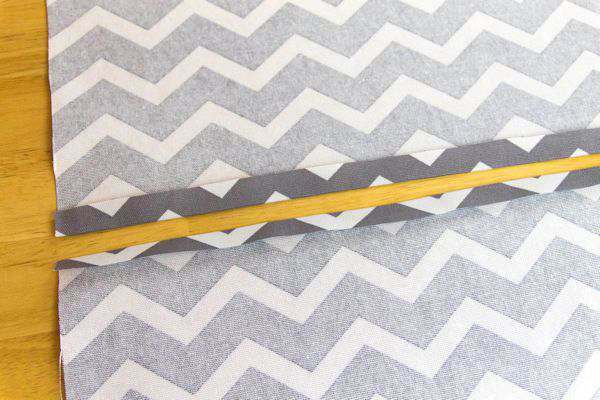 Makes sewing easy and you won’t have to pin it down. I sew one line down each edge and then go back and sew another line close to the previous line. Use your pressure foot for guidance here. You don’t have to sew the second line but I think it just makes the back of the pillow look nice. Important part now. Time to lay out the pieces. Make sure you have the RIGHT sides together. You don’t want to know how many times I have done this step wrong. As you can see in the picture above, the large 19 x 19 piece is on the bottom. Lay the two pieces you just sewed the seams for on top of that. Doesn’t really matter which one is on top. Just make sure the seamed ends are in the middle of the layers and not on the edge. Take your straight pins and pin around the edges here and there to keep the pieces from slipping while you sew. 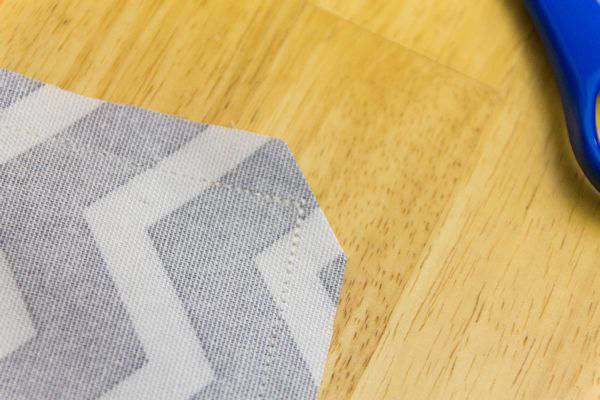 Sew a 1/2 inch seam all the way around the edges. Be sure to remove a straight pin before you sew in that area. I know some machines are supposed to sew over straight pins, like mine, but that’s not always true and you will break a needle really quick. Stop at about 1/2 inch at the end of one side with your needle IN the material. Lift up the pressure foot and turn the material and line up for the next side. Keeping the needle in the material will keep your spot still. Put your pressure foot back down and off you go. I do backstitch my corners and over the seamed area, you sewed before because those are stress points. It just makes those areas stronger. 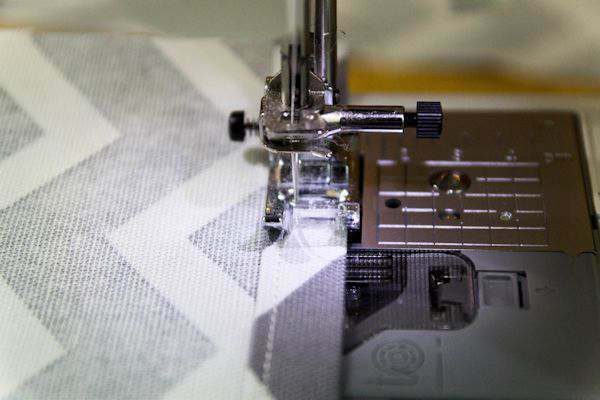 To help the corners lay correctly when you turn the pillow inside out, cut the corners as shown in the picture above. This will help the corners lay nice and flat. You can also see where I back stitched the corners to make them strong. Backstitch just means you stitch just a bit then back up the same amount. My machine has a button to push to make the machine go in reverse. The tricky part is getting the corners to make a nice angle after turning the material inside out. I take my point turner and gently push the corners out. I will also rub the corner on the outside of the pillow with my fingers and sometimes that will help the corner pop out straight. If you are using the thick material it may not make a perfect corner but with practice, you will learn the best method to make a nice corner. I also iron down the pillow to make the seams look nice. Here is what the back looks like. Clean and simple. Easy to add the pillow form into the slot. Insert your 18 x 18 form pillow and you are done! You can make this pillow in just a couple of hours and think of how many you can make in an afternoon. My pillow sits out in our lanai area to replace the Christmas pillow I made. Same pillow form, just different cover. I take my pillow covers and hang them in the closet using a clip pants hangers. I don’t want to fold the cover because I don’t want the vinyl area to crease. 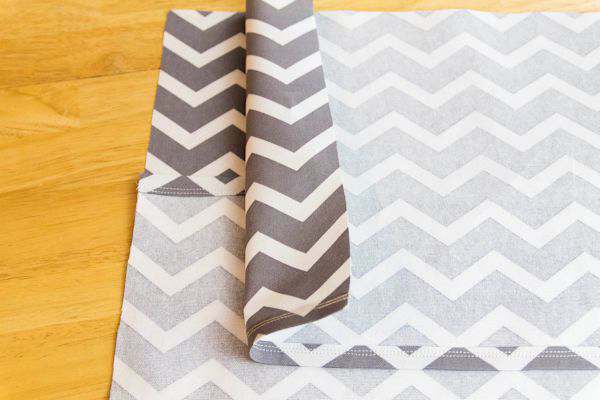 If you are wanting to make a different size pillow cover here are a couple of other measurements. If you would like to figure a different size pillow, this is what I do. 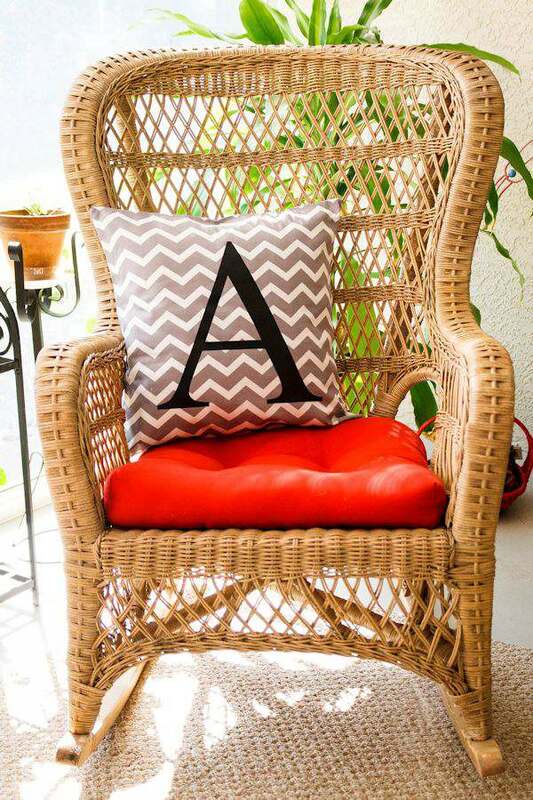 For the large front square piece – Using pillow form of 18 x 18 just add an inch all the way around the square. So you cut a 19 x 19-inch piece of material. For the shorter back pieces – You will need to add 6 and 8 inches for the overlap to work. Using the 18 x 18 pillow form again, 18 + 6 = 24 and 18 + 8 = 26. Divide the numbers by 2. So, the pieces will be 18 x 12 and 18 x 13. Add an inch for seam allowance and the size would be 19 x 13 and 19 x 14. The length of the overlapping area is flexible if need be. 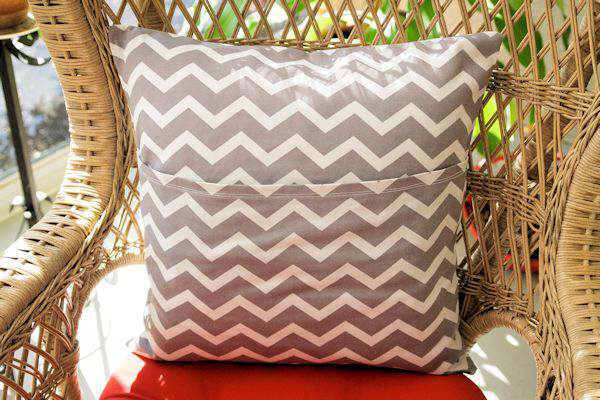 What kind of pillow cover would you like to make? This is adorable, Tammy! I got a sewing machine for Christmas many years ago and it has collected dust ever since. I may have to pull it out to try this. Thank you :). Pinned! Thanks Candace. I can’t wait to make some seasonal pillows. I had hubby out looking at material this morning. LOL He did give me an idea or two. These pillows are adorable, but I must admit that I can sew to save my life!! Thankfully my sister is good at sewing and she helps me out! Rebecca I have heard so many others say they couldn’t sew. But it turns out they can. I love all the possibilities of items that can be made with a sewing machine. That looks so easy! I hope I can pull it off. The pillow looks great as well, thanks for sharing this tutorial! These is really great. The pillow is so beautiful 🙂 Hope to try these soon 🙂 Thank you for sharing. Perfect timing! I am looking for ideas to re decorate my living room without hurting my budget. Making my own throw pillow cases will save me a lot. I know you will love making one of these. Thanks for stopping by. This looks so easy to make, maybe even I can do it lol. This would be a great housewarming gift.